The day was overcast and a little chilly, but it was dry and there was no wind. 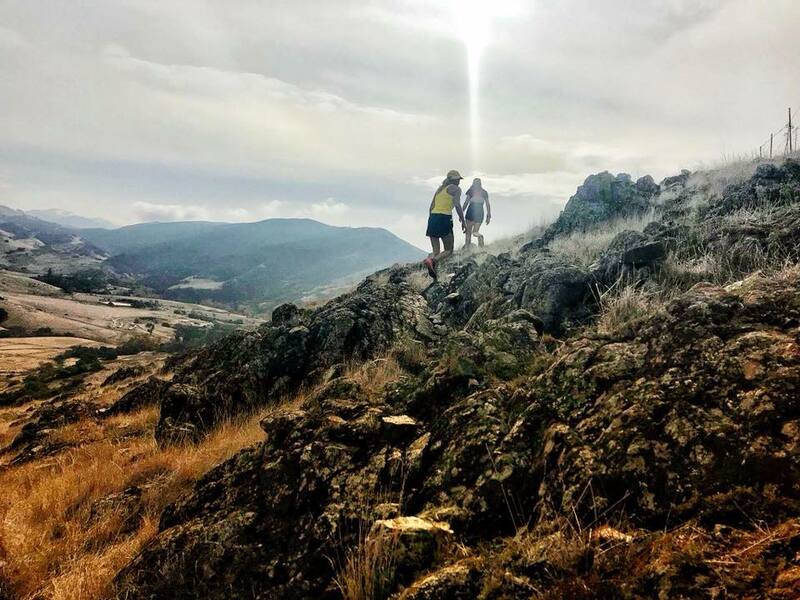 It was a perfect day for the first women’s group trail run I had organized. I use the word organized loosely; I had posted on Facebook early on in the week that I wanted to knock out a moderate distance trail run on this particular Sunday, and instead of the mostly “I’m busy,” “that’s too early/late,” or some other negative reply, I had several “yes” responses! Plans on where to meet and distance and a planned water stop were made. And so it was on that December morning, eight of us gathered to crush leaves hiding the dirt and to commune with nature and ourselves. Several of the ladies running that morning were well known to me. I had ran many miles with some of them and others I knew from playing leap-frog with them at local races. There were two women new to me, and were gladly welcomed as part of our crew. We also had three ladies of the four-legged variety join us on this trail run! After meeting at a coffee shop to caravan, we made our way down the Blue Ridge Parkway to the Mountains to Sea trail on the Eastern edge of Asheville. We took a few pre-run photos to commemorate our endeavor, and then we were off with me and my pooch, Isis, leading at a very moderate pace. All of us are regular runners but our paces are varying, to say the least. I was not the fastest or the slowest amongst our band, but since I was familiar with this section of trail, I led the foray into the woods. A few words on how this Sunday morning even came to be….. I still consider myself very much a newbie trail runner. After years of hiking and tromping through the woods, it was only natural that three years of running would eventually lead me to run the trails. 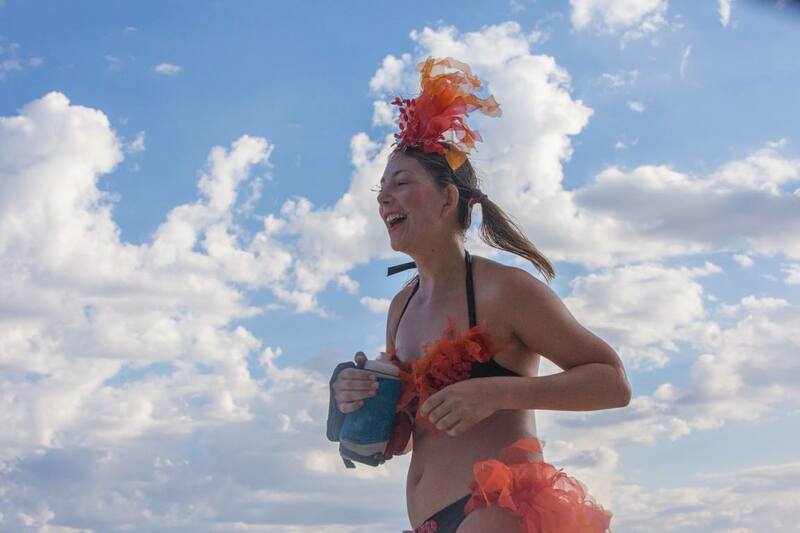 I bit the bullet this summer, signing up for my first trail race, the Springmaid Splash 10K. As I lined up at the start line in August, I was petrified. 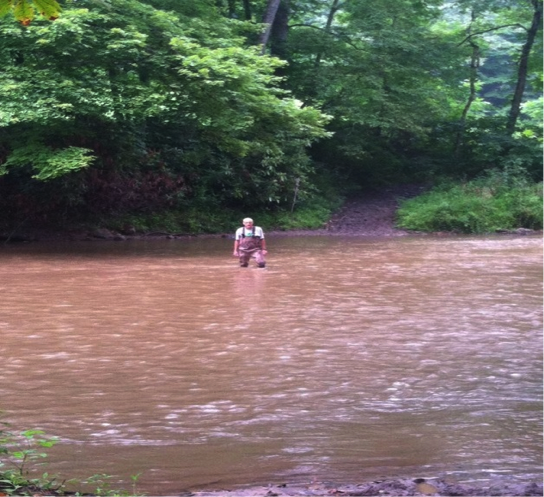 I had only trained on the flat-ish, heavily traveled trail of the MST near my home in Asheville. The wilderness of Spruce Pine, North Carolina was foreign to me. All I knew about the course was the elevation gain/loss and that there were three water crossings, including a river crossing. On the elevation chart there was a point at Mile 3.5 that looked like one would actually be defying gravity, such was the climb! There was nothing rolling about the trail at all! And so I ran when the air horn blew with hopes of a finish around 1:45. While the course was difficult, I was falling madly in love with every footfall, and when I crossed that first finish line at 1:22, I was thrilled- and addicted! Trail running became part of my regular running repertoire. I was (and still am) on a Runstreak, so I began to incorporate at least one trail run a week, usually saving it for my weekend long run. 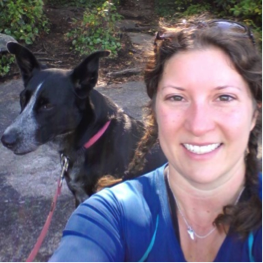 I have had the chance to meet some wonderful folks in the local running community that is so prevalent in and around Asheville, and am always inviting these dirtbag beasts of the road and trail to join me in my daily running ventures. And this is how we all came to be together on this Sunday December morning, running a section of the MST where the trail avoids a road crossing for almost four miles. The Mountains to Sea trail is an almost 1,000 mile journey from the Smoky Mountains to the Carolina coast. The stretch of trail around the Asheville area parallels the Blue Ridge Parkway and there are several places along this route where the trail meets the road, to cross over bridges, or where the trail actually traverses the Parkway. The MST is not the most remote of trail by any stretch of the imagination; however, its accessibility is its beauty. Only 10 minutes from downtown, the MST is a foot-only path and is heavily used. This is not to say you would be fighting off the masses on this section of trail. 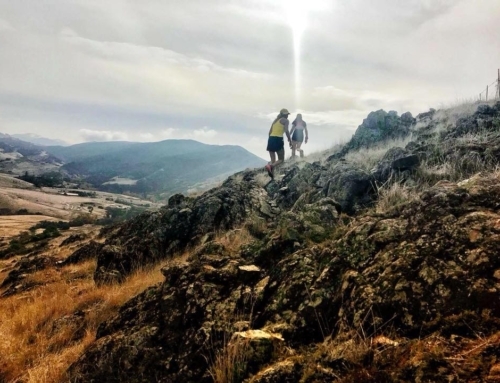 On the contrary, I have never encountered an out-of-towner on the trail, despite the Blue Ridge Parkway being the most visited National Park in the United States, and there have been many occasions when I am the only one running the trail. 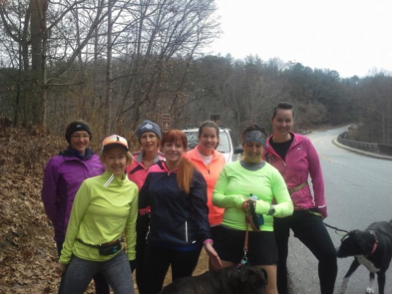 It was two weeks prior that I chanced upon this segment of the MST, joining a group run with some dirtbags who were members of the WNC Trail and Ultra Runners coalition. 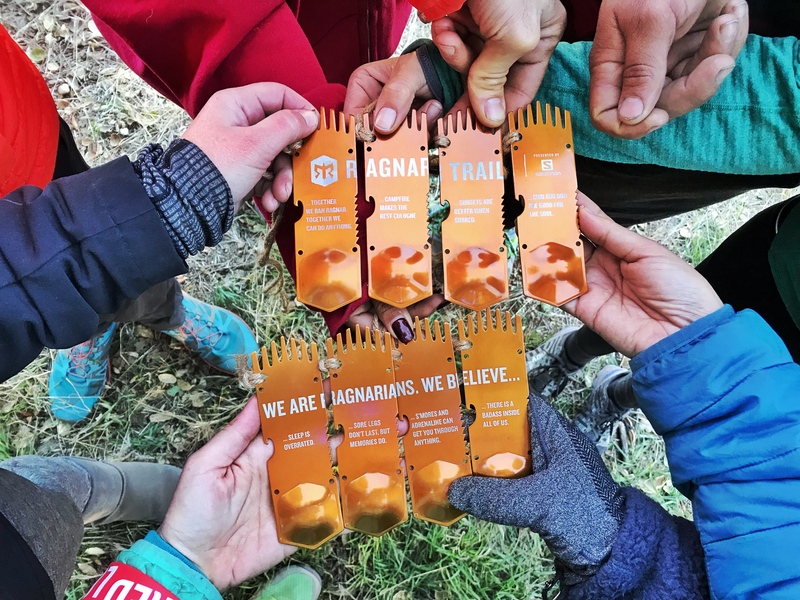 Wanting to explore the local trail systems with those who knew it best, I waited until I found a run I actually thought I could complete with these folks; most trail runs with the WNCTUR were looonnnggg runs, at a much faster pace than I could muster even on race day! The 10 mile run I was a part of on that day was appealing for a repeat trail jaunt as was mentioned previously, the trail never crosses the road. 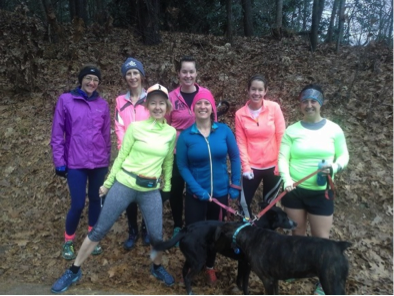 With dogs in tow, and the differing paces, this was a perfect introductory women’s group trail run. Also, while following the same bearing as the Parkway, the sounds of vehicles were lost in the canopy of the natural surroundings. Numerous conversations were spoken between the eight of us as we pushed through our first miles. Almost immediately into the trek, two groups emerged about two minutes apart in pace. Throughout the morning we faster paced ladies slowed and stopped so that we could all run together for a short while, and to make sure no one was injured or lost. 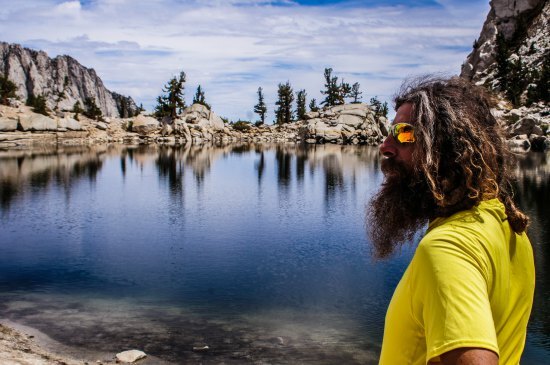 We were not out to set any land speed records, and we were all recovering or training for something, so were all out in the woods to enjoy the trail, catch up on our lives, and to take care to not trip on those damn roots and rocks that were constantly jumping out at us!! The trail in this section was rolling and fairly moderate in elevation, especially for the Asheville area. Two favorite sayings amongst the local runners when speaking about the elevation changes here are “what goes up, must go up some more” and “even when you think you are running downhill, you are running uphill!” Since we were not worrying too much about intense elevation gains or losses, we were all the more concentrated on the technical aspects of the trail. 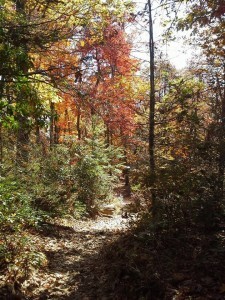 Being mid-December, and even with the popularity of the trail, leaves were deep and hid secrets of roots and rocks. There were a few small stream crossings that we took care to walk over as the surrounding path was a little slippery. As is typical in the Southern Appalachians, rhododendron are everywhere along trails and so even in the deep of Winter, there is green in the forests. We admired the scenery around us and thought ourselves so lucky to live in such a gorgeous place! As we neared Mile 3 the trail went from bare, deciduous trees to more of a pine forest. We lost the thick floor of leaves and what replaced it were dry, rust colored pine needles. The sounds of the path quieted while our breathing was a little more pronounced, and the conversations shortened and sporadic. We made our final climb as we approached the intersection of the MST and Parkway, and a planned water stop, dubbed “Julie’s water station.” The route of our run was out and back and on our way to the gravel parking area, I dropped water and cups behind the wall of the bridge over Highway 25-A, eliminating the need for all of us to carry water. While we took a five minute respite, a group of dirtbags passed us and included several of those I had been with two weeks prior. I figured we would chance upon this bunch as I saw a posting for a ‘moderate’ 20 mile run to coincide with our romp! Armed with this knowledge, we joked with them that we were halfway through our 30 mile run (they were at Mile 16)! Our thirst satiated, I tucked the water and cups into the hollow of a downed tree to be picked up post-run, and we turned back the way we had traveled. The trail was steeper on the return trip, and the ladies argued with me playfully on my description of the trail as “flat.” We stopped at the water crossings to allow the dogs to drink, and we passed a few hikers out enjoying the day. We returned to the cars to say our goodbyes to half of our party while four of us would continue on to get in a couple more miles. We wished each other well and happy holidays and made promises to run together again in the New Year. The trail North of Highway 74 begins a stretch of steady climbing through much rockier and technical terrain. Eight miles under our belts, we were tired and our legs and lungs protested the change in elevation. A mile in, we turned back, and our quads took a beating on the downhill. Once again at our cars, we talked about upcoming races and shared more hugs. We left each other, now early afternoon, with a sense of fellowship and accomplishment. We vowed to run at least once a month with this group, and hopefully with others as well! For me, this run was wonderful to share with my girlfriends. No one else had previously ran this section of trail-always just on one side or the other. It was great to meet new people, and to get to know my other friends a little bit better. There is something magical in the forest, and I was happy to spread that wonder!